Simple arson, commonly referred to as just arson, is a fairly basic concept. The first thing that comes to mind when someone says arson, is fire. What people do not stop to think about are the serious charges that are a third degree felony offense in New Jersey. 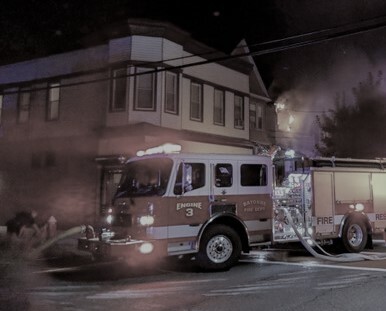 More importantly, for juveniles, this is not always something that can be brushed aside as being “youthful ignorance.” Instead, the Burlington County Prosecutor’s Office will file charges against a juvenile for arson under N.J.S.A. 2C:17-1(b) when the juvenile if he purposely starts a fire or causes an explosion, whether on his own property or another’s, in 5 possible situations (discussed below in more detail). Juvenile charges, while handled by the Burlington County Prosecutor’s Office, will not be transmitted to the Criminal Division. Instead, your matter will be heard and ruled on by a Family Division Judge who will determine whether or not to adjudicate your child as delinquent. If you or your child are adjudicated delinquent, then the judge will consider sentencing for a third degree juvenile offense in accordance with N.J.S.A. 2A:4A-21. This statute establishes a maximum of 2 years in a Youth Corrections Center as well as possible fines, probation, community service, mental health or substance treatment. Contact our trial attorneys to handle your juvenile matter by calling 609-850-8284. At the very least allow us to assist you in understanding exactly what it is your dealing before you jump head-first into battling these juvenile charges. Recklessly placed a forest in danger of damage or destruction. Does the Fire Have to Cause Actual Damage? No. It is not necessary that any significant damage be done. It is only necessary that a fire be started/an explosion be caused for (one or more of) the purpose(s) or under (one or more of) the circumstances just described. The lack of success of the perpetrator is immaterial. A juvenile acts “purposely” if it is his/her conscious object to engage in conduct of that nature or to cause such a result. A person acts purposely with respect to attendant circumstances if he/she is aware of the existence of such circumstances or believes or hopes that they exist. Purpose is a condition of the mind that cannot be seen and can only be determined by inferences drawn from the defendant’s conduct, words or acts. A juvenile acts “recklessly” when he/she consciously disregards a substantial and unjustifiable risk. The risk must be of such a nature and degree that, considering the nature and purpose of the juvenile’s conduct and the circumstances known to him/her, its disregard involves a gross deviation from the standard of conduct that a reasonable person would observe in the juvenile’s situation. What are the Penalties for Juvenile Arson Charges in Mount Laurel? As previously mentioned, arson is a crime of the third degree. This means that under juvenile sentencing guidelines, a juvenile adjudicated delinquent of third degree arson will face upwards of 2 years in the Burlington County Juvenile Detention Center. There may be an alternative to a delinquent adjudication and detention altogether. The juvenile deferred disposition program is a diversionary program that allows for juveniles to have their matter placed on hold pending completion of court-mandated requirements. Speak to an attorney to determine if your child is eligible for a deferred disposition in their Burlington County juvenile matter. Finding the right attorney can be difficult. It’s important the you feel comfortable not only with your attorney’s skill and experience but also with their personality. Contact our firm at 609-850-8284 and find out what we can do to help you or your child with their charges. Take the opportunity to get to know your attorney before diving head-first into an attorney-client relationship. Picking the right attorney is the biggest decision you will make in protecting your child in their juvenile proceedings.